The best sandwiches are carefully made with only the highest-quality ingredients. Hellmann’s® brings out the flavor of quality meat and produce. Ranked highest for taste, texture and performance. Guests want healthier options that taste great – Hellmann’s Light Mayonnaise contains half the fat, with all of the classic rich flavor your guests love! 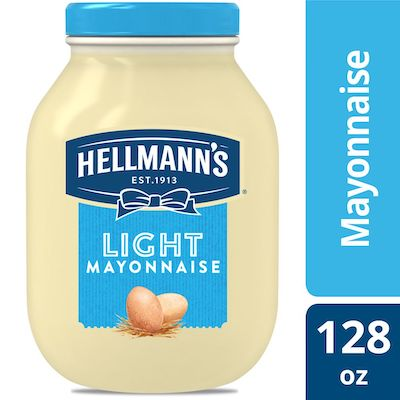 Hellmann’s Light Mayonnaise for Food Service (Gallon, 128 oz) provides the highly desirable balance of acidic and sweet flavor notes to enhance your menu items in a way that is unmatched by other brands. Maintains cling, consistency and stability - even when heated. Superior emulsion resists breaking down while your recipes retain outstanding texture, mouth feel, flavor and eye appeal. Outstanding performance reduces waste and lowers cost. Use it as a condiment or to make outrageously delicious entrees like juicy turkey burgers, chicken salad, potato salad, and tuna salad. Check out other products in the Best Foods or Hellmann’s assortment – Hellmann’s is known as Best Foods East of the Rockies. Unilever Food Solutions offers great products and recipes for chefs that save prep time in your professional, commercial kitchen, improves your menu and excites your guests – created by Chefs for Chefs. Ready to use. Great for burgers, sandwiches, dips, and tuna, potato, or macaroni salads! Hellmann’s Low Fat Mayonnaise, with 3.5 grams fat and 35 calories per serving, helps limit fat, calorie and cholesterol intake. Exceptional performance in high-moisture bound salads means less weeping, which improves yield and delivers visually appealing salads. Promoting your mayonnaise as being made with 100% cage-free eggs may increase patron appeal.